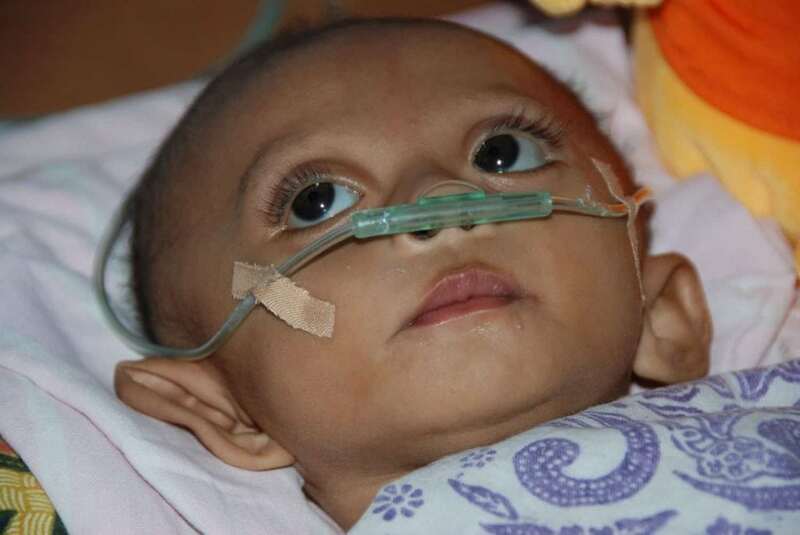 We met baby Christian in Indonesia, where he was severely malnourished and struggling to survive. Matt, one of our staff members, shared his travel journal from the visit. I couldn’t believe it, that cute little baby boy I met just a couple of days ago in his home, was now fighting for his life. Not too long after the call, I arrived at the hospital. When I walked into what was supposedly the emergency room but looked more like a run-down dormitory, I saw Marni, Christian’s mother hunched over his bed in total exhaustion and emotionally drained, holding on to her son’s tiny hands. She hadn’t slept all night, and neither had Christian. When I asked Marni what happened, she explained that Christian had developed a high fever and was having very bad diarrhea, which sounded like the usual, but this time he had trouble breathing. She thought he was going to die, so she brought him to the hospital. “My son needed a doctor,” she said. He just lay there, swallowed up in his huge hospital bed, with a device attached to his face to help him breathe. In the few short hours that Christian had been sick, he had lost a lot of weight – not good for a child suffering from extreme malnutrition. Realising Christian’s critical state, the doctor wanted to keep him in hospital until he put on at least 2 pounds, but this could take a month, even longer, as in the six months since he was born he had only managed to put on 4 pounds, which had doubled his birth weight but was still well below the healthy weight target of about 17 pounds. The doctor was also concerned that Christian had received no immunizations, leaving him open to all kinds of illnesses and diseases. But for Christian to receive his first immunization, he needed to enter a more healthy weight range. And for this to happen, he needs to stay in the hospital. Marni’s response tore at my heart –she just looked at me with an uneasy smile and said: “I don’t know.” Not the answer I wanted to hear at all, but sadly it’s the truth. A month’s stay in hospital would cost Marni and her family about $110, more than four weeks of the family’s income. But if he didn’t stay, he would likely die. What if we started our Health and Nutrition Education Program a year or six months earlier, would Christian have been admitted to the hospital? Or what if Christian’s parents could afford to get married, would he be fighting for his life? There are so many ‘what ifs’, but at the heart of it all is the fact that Christian’s situation is a direct result of poverty. Because of poverty, Christian was born malnourished and continues to be. Because of poverty, Christian’s parents can’t get married so he can’t receive the medical attention he needs. And because of poverty, mothers like Marni are forced to choose between the welfare of her family and the life of her baby. These things shouldn’t happen, but they do EVERYDAY! Please help ADRA save the lives of children like Christian. Your gift of just $48 will help us to reach 21,000 children this year through our health and nutrition work in Africa, Asia and Inter and South America.